Installing Aspect peel & stick matted Glass tiles is a simple, exciting project that adds instant style to your kitchen or bath. We have deliberately over-explained the tile installation. Have fun with this project. It’s going to be easy and look great! 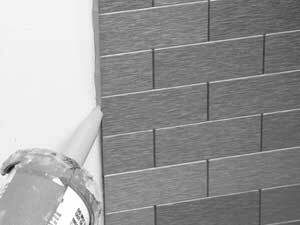 The adhesive on the back side of the Aspect matted glass tiles is engineered to stick to flat, primed, smooth walls. The substrate to which you are applying Aspect tiles must be primed with a fresh coat of latex or primer such as Zinsser® or KILZ® (or similar products). Ingredients in “paint & primer in one” products can cause adhesion failure; as such, be sure to use a stand-alone primer. See below for Method 2 if you prefer not to prime the surface. Occasionally, even after properly preparing the substrate, the surface can still have bows, high spots, ridges, or uneven areas. Place a level against the wall. If there is a 1/8″ gap or greater, use a filler such as spackling or drywall compound to fill in imperfections. Measure the first area to be covered by Aspect material. We recommend you lay out the entire project on a flat surface, like the countertop, a table or the floor, before adhering to the substrate, to be sure you have enough tiles and your design and layout is correct. This will also give you a good reference as to how the tiles will look on your wall. One popular layout method is to begin from the inside corner of your counter and work across left to right. This method allows you to use two points of reference, your vertical wall and horizontal countertop. Note: when using these two points of reference, be sure to check them for level on the horizontal plane (Picture A) and 90 degrees plumb on the vertical plane (Picture B). This will prevent any problems as you build your backsplash. Here’s where the fun begins. Be sure the substrate is clean and dry. Remove the adhesive liner from the back of the matted tile and discard the liner. Align the tile where you want it on the reference lines. The aggressive nature of the adhesive does not allow for repositioning after pressing firmly. If it is in the right position, firmly apply even pressure across the entire tile. When applying subsequent tiles, first “dry fit” the tiles with the adhesive liner in place to ensure proper fit. Dry fit tile against the wall exactly where it will be placed. Install the next 3 to 4 subsequent tiles by light tacking or pressing them on the wall. At this time verify that the tiles are lining up straight and square. If they are you can firmly press on the tiles to secure them to the wall. If some of the tiles have come out of alignment you can work backward and remove the tiles using a putty knife. Then reapply the tiles making small adjustment to each tile to regain alignment. Place each section as if placing a puzzle piece (Picture C). DO NOT bend tiles backward as it could damage the tiles or permanently stretch and misshape the tile matting. Do not stand or walk on release paper or a tile with release paper on the back as it is extremely slippery. Place it in a wastebasket immediately upon removal from tile. Do not skip ahead in tile section placement as alignment issues may occur; complete all tiles in a progressive manner. At the beginning and end of each row, cuts to one mat will be required to tie into the whole mats that are already installed. See cutting directions below. When cutting the tiles use one of the recommended tools and methods listed above. A wet saw (Picture G) with a glass-cutting blade is the recommended cutting method. Alternative cutting methods include a glass tile nippers or a simple manual glass-cutting tool (Picture H). Measure where the cut must be made (Picture E). Map out and mark the cut using masking tape to cover the surface of the tile(Picture F). Cut the tile. Debur sharp edges with file or sandpaper. Take the cut tile to the work space and place it in its intended location, ensuring it fits properly. Cut and install all remaining tiles using the same steps described above. When tiles are installed to your satisfaction, press each again firmly with your hand. This will ensure that the adhesive bonds to the substrate. Allow 24 hours for the adhesive to set before exposing tile to a heat source (such as a stovetop or oven). Clean or touch-up tiles with glass cleaner and soft cloth or paper towels. If desired, apply a 1/8″ bead of caulk or silicone sealant in the gap under the bottom row. Wipe off excess sealant. Choose clear or colored caulk according to your preference. To finish the edges of your tile backsplash, Aspect trim is available online at DIYdecorStore.com. A second option is to seal the outside edges with caulk using the same materials and method used to seal the gap under the bottom row of tiles. If tiles need to be removed, use a putty knife and a heat gun or hairdryer to make the process easier. Note: By removing tiles, you risk damaging your walls and the tiles may be unusable.